News and Info - a2b ecycle - electric bicycle, sales & rental co.
One of the coolest things about electric bikes is how easy it is to keep them running well and how easy it is to repair them. Cars these days are so complex that even people who used to work on their older cars are forced to take their newer cars to a mechanic for costly maintenance and repairs. Being able to maintain and repair your own e-bike is another way to save money and an advantage over costly car maintenance. First of all it is always a good idea to keep your battery topped off. Some batteries can handle being drained all the way down but in general it is a good idea to always charge your e-bike battery when you can. Consider charging your battery when you are at work or when you stop somewhere to run errands. Most employers and shops are ok with people charging their batteries when they understand that it only costs pennies to fully charge an electric bike battery! Keeping your battery topped off is good for the overall life of your battery and it helps if you have an unexpected trip you need to make and you need the extra juice. The second tip is to keep your chain lubricated with a good bike chain lubricant. This will keep your bike running smooth and efficient and it won’t make that squeaky ”old bike” noise! Just apply the lubricant to the chain and let it sit a few minutes before wiping off the excess lubricant with a shop rag. Eventually you will need to clean the chain with a degreaser to remove all the excess dirt that has collected on the chain. Finally the last tip is to keep your tires inflated to the proper air pressure. This will keep your bike running smooth and efficient and it will prevent flats. If your tire pressure is too low your bike will be more difficult to pedal and you risk a pinch flat (when you roll over an obstacle and it causes the tube to puncture by pinching it between the tire and rim). If your tire pressure is too high it will make for a rougher ride. As a good rule of thumb I recommend 50 psi for an e-bike that will be used for cruising around town for an average rider weight. For a lighter rider 40-45 psi and for a heavier rider 55-60 psi. Here is a video I did on maintaining the proper air pressure for your bike tires. It covers the two different bike tube valve types that you may have. A wide variety of people take our bicycle education courses, and some of them are new to bicycling, are not very physically fit or are older people who struggle with a hilly city like Columbia. These students find it difficult to ride a bicycle even short distances. I know that for every rider who is painfully taking those first steps toward fitness there also are people in our community who lack the fitness to ride a regular bicycle at all. Just the thought of bicycling up a hill seems like an impossible task. That is why I am really excited about an improved segment of the bicycle industry, the electric bicycle. You might be wondering, “Why would a proponent of exercise would be talking about an electric bicycle? Wouldn’t that be just one more thing that enables Americans to life a sedentary lifestyle?” Although it’s true that most of the old electric bicycles did just that, many of today’s models use two energy sources: the rider’s pedaling and the electric motor. In fact, many models only activate the electric motor if the rider is turning the pedals. This allows the rider to gain fitness while suddenly being able to tackle the hills and distances that had kept them off the bicycle all those years! Electric bicycles have been around a while, but it was the quantum leap in technology that gave them new life. The older models were unsophisticated machines with heavy batteries that only lasted a few miles. Today’s new battery technology has caused an explosion in the industry that makes the new electric bikes hard to distinguish from a regular bicycle. One model that I rode had a lithium-ion battery, just a couple of inches high, neatly placed right on top of the rear rack. 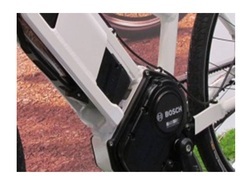 Modern battery-charging systems have also been a game-changer for electric bicycles. One manufacturer is even boasting of a battery system that charges in as little as 30 minutes. The range for electric bikes has increased as well. Many of the models that I researched will travel 20 to 40 miles now, more than enough for most city commuting. 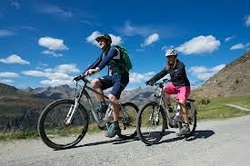 Modern electric bicycles also have advanced features never dreamed of several years ago. One of those is “regenerative braking.” This feature allows a rider to use the electric motor to slow the bicycle while traveling downhill and use that force to generate electricity for later use. The design allows more than 10 percent more battery life and saves wear and tear on regular braking systems. Another feature is a bicycle that senses how much effort the rider is applying to the pedals and calculates the amount of electric “boost” the bicycle needs to supply. When I rode one of these machines, I was really impressed at how well this works. It makes riding an electric bicycle just like riding a regular bicycle — only a lot easier! Most models also have a way to manually adjust the power output to meet your needs. Electric bicycles can open up a new world to people. 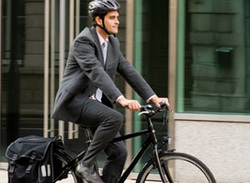 Arriving at work a little less sweaty or commuting from a little farther out can be easier. Carrying a trailer full of groceries up Chapel Hill Road, pulling a child in a trailer to the park or riding to Rocheport for lunch can be a reality for regular folks and not just the fittest Columbia residents. For some it might be just the tool they need to take the first step toward a more active lifestyle. No doubt about it, I am very excited about electric bicycles. But we still need to get to work. We still have to commute. Keen cyclists already pedal to their desks, but this solution isn’t right for everyone. Perhaps the answer to the short commute is the easier alternative. Enter the electric bike. Why the Electric Bike?Electric bikes have been around for a while. Initially their reputation was damaged by the flood of cheap Chinese imports, but over the last few years innovative sleek models have entered the market place at various price points. Giant and Raleigh have recently launched their £1,000 models, then there are the Shadow bikes, Koga and Hercules which are nearer the £2,000 mark. They are growing in popularity. According to Frank Jamerson’s Electric Bikes Worldwide Report, annual production of e-bikes in China reached 27m in 2010 up from just 58,000 in 1998. And in 2011 around 60 million cars were sold worldwide and during the same period, 31 million electric bikes were also purchased. Of course an electric bike isn’t as green as a push bike because the battery requires electricity which on average equates to 2.6 grams of CO2 per mile compared to 150 grams for most electric cars, and 136 grams for scooters. But, like all electric vehicles, their carbon emissions whilst running are zero. The CommuteIn July this year, UK electric bike company, Just E-Bikes presented their research to Norman Baker, the UK Transport Minister in the hope of outlining the benefits of using e-bikes as an alternative to cars. They surveyed 43,000 public and private sector workers and found that 22% lived within 5 miles of their workplace and yet still commute by car each day. If 22% of the UK’s working population commuted on an electric bike instead of a car it would save £11 billion and 3.8 MtCO2e per annum. This is the equivalent to the amount of carbon the UK’s woods and forests take from the atmosphere each year. What comes first? Bike lanes or the bike?If the electric bike booms and global sales (albeit it slow in the UK and U.S.) continue to rise along their predicted trajectory, where are the cyclists meant to go? Electric bike companies claim that electric bikes are safer than regular bikes because of their consistent speed, reduced wobble, and reliable acceleration at junctions and roundabouts. But if 22% of the UK commuting population did switch from bike to car, where are the cyclists meant to go? Is the current infrastructure safe enough? Indeed, Transport for London (TfL) estimates that the amount of cycle journeys will reach 1.5million by 2020. If this is the case, other services may also need to be considered. For example the provision of free cycle pumps like the ones already springing up in London, the first one was installed near London’s Imperial War Museum by Cyclehoop. (www.cyclehoop.com). There would be a need for extra cycle security and storage, and perhaps even the extension of practical schemes such as the Suffolk based incentive where local pubs stock puncture repair kits for passing cyclists. There are already cities which safely incorporate cyclists in their hub, London being one of them. But if the average 5 mile commute by car was to become an e-bike journey, then many urban landscapes would need re-thinking with cycling safety and ease in mind. Perhaps only then would attitudes shift and e-bikes could become the preferred mode of transport for future commuters, helping us to live longer and happier lives. STUTTGART, Germany – Bosch has founded Robert Bosch Battery Systems recently as the company expects that demand for electric vehicles and plug-in hybrids to sharply increase from 2020. On 13 December the company announced to position its development and production of efficient storage technology under one roof and to particularly focus on complete battery systems. Robert Bosch Battery Systems is to set up a European network of battery specialists. Former business unit SB LiMotive Germany GmbH based in Stuttgart and Cobasys LLC located in Orion/Michigan in USA have been fully integrated into the new e-mobility roof. Bosch Group has acquired former Bosch and Samsung SDI US-joint-venture Cobasys in October. As part of the company’s further battery activities Bosch have taken on all existing battery system projects. Former joint venture partner Samsung SDI is planned to be the cell supplier. Nevertheless Bosch has now the flexibility to use also cells from other manufacturers. “The Fiat 500e, which was recently unveiled at the Los Angeles Auto Show and will go into series production in 2013, is the first all-electric vehicle with a Bosch battery pack”, is noted in a press release. As part of the stopped joint venture with Korean SB LiMotive Co., Ltd. both parties agreed to give each other access to the patents. On this basis both parties will be independently able to develop new generations of cells and the production methods for more efficient and economical energy storage. Bosch wants to cooperate closely in this field: “With specialist partners from industry and higher education to establish research and development work on high-performance battery cells in Germany and to set up a European specialist and supplier network”. Moreover the new-formed roof Robert Bosch Battery Systems: “Is concentrating on the battery system and in particular battery management and matching energy storage to the vehicle as a whole, which includes all aspects of mechanical and electronic integration. After all, the efficiency and performance of electric vehicles depend on obtaining the optimum interaction of all electric and electronic components and managing major battery variables such as temperature or state of charge so that they meet the specific requirements of different situations. Developments in these areas can deliver significant improvements in range and charging time, which are the decisive factors for the success of electric vehicles. This is one of the reasons why Daimler chose Bosch battery management system for its Smart EV,” notes Bosch.